Captain Smith of the Privateer ship SS Mosquito was usually a clever man. 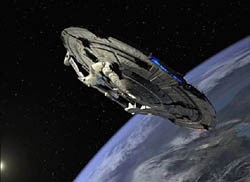 When he had bought the obsolete hunk of scrap, affectionately known as an NX Cruiser, he had been smart enough to spend as much as required in order to bring it back up to its original specs, as Starfleet had disabled the weapons and engines prior to scrapping her. He had considered buying some photon torpedoes, but by the time he had finished repairing the ship, he was mostly out of money. However, Smith was not smart enough to turn down the request from an obscure mining company to investigate certain systems close to the Klingon Neutral Zone. Whilst he was poking around their, the Glorious Klingon Empire accused him of spying and attacked with three Birds of Prey. Captain Smith had been smart enough to escape and put out a distress call to the nearest Federation ship, which was how he found himself in the current situation. This is a pursuit scenario. The Excelsior is at the right of the board, heading left. The B’rels are at the far left of the board heading right, and the NX is in the centre heading towards the Excelsior. All vessels are moving speed 5 initially, and the is a floating map. The NX Experimental cruiser has already received the following damage. Destruction of Light Plasma Cannon 9, 9 points of damage to primary hull, 6 points of damage to starboard warp nacelle. The Khitomer accords have recently been signed, so the destruction of the Klingon vessels is not preferable. The Klingons can not really afford to lose vessels, as their empire is in a weak position with the destruction of Praxis. Protecting the SS Mosquito, whilst forcing the Klingons to withdraw without destroying all of their vessels is a major victory, or if the Klingons are disabled. A minor victory is won if the NX is protected but with the loss of all Klingon vessels, as this will not help interstellar relations. Eliminating a Federation vessel for no loss is a major victory. Eliminating a Federation vessel for a loss brings a minor victory. A draw occurs if both sides sustain no losses. The B’rel’s came barrelling out of cloak to the starboard of the Mosquito, opening fire they caused some damage to that side. Smith, knowing he was in a dangerous part of space, had his weapons armed, immediately opening fire with his phase cannons and light plasma cannons. However, the plasma bolts all missed, and the energy from the phase cannons splashed uselessly across the Klingon shields. Realising that he was outnumbered and outgunned, Smith fled into warp speed, heading towards an Excelsior class vessel that he had detected, and dropped to impulse nearby with the Klingons in hot pursuit. Once the Klingons realised that they where going up against a brand new Federation starship rather than an ageing bucket of bolts, they reconsidered what they were doing. Losing off a few photon torpedoes in a parting gesture at the Mosquito, the B’rel’s cloaked, and returned to Klingon space.